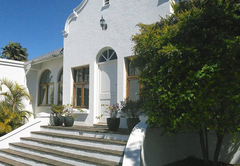 La Bonne Auberge Guesthouse is a highly recommended guest house with self catering option, providing accommodation in Somerset West for tourists visiting the Cape Helderberg region. 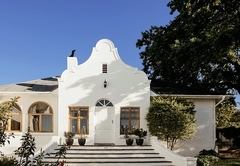 The charming Guesthouse La Bonne Auberge is situated in the green heart of Somerset West, in the peace and security of one of the most exclusive residential areas of the Cape Peninsula. 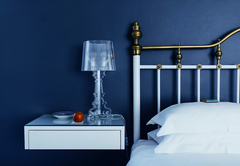 There is a choice of six stylishly furnished and beautifully appointed bedrooms - each with en-suite bathroom, air condition, as well as satellite TV, WiFi access, mini-bar, safe, and hairdryer, down duvets, tea / coffee-tray, terrace or patio. 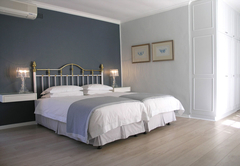 Whether you are planning a relaxing holiday to escape and unwind, or a trip packed with adventure and new experiences, La Bonne Auberge Guesthouse is the perfect choice of accommodation for your holiday in the Cape Winelands. 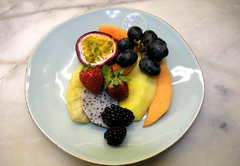 Start each day like a holiday and enjoy the delicious breakfast in the shade of an old oak tree. 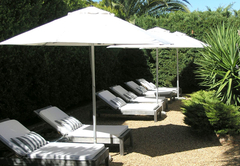 Relax in the tranquil garden under the palm trees. Dream at the pool-side on an inviting pool-lounger; refresh yourself with a dip in the large swimming pool. 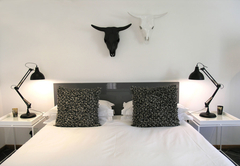 La Bonne Auberge not only offers you home comforts and German hospitality, it is also ideally situated for you to make the most of the fantastic activities, leisure options and day trips the Cape has to offer. 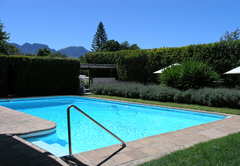 More than 25 golf courses are nearby; Erinvale Golf Resort is only 3 minutes away. Numerous beaches, like Blouwbergstrand on the Atlantic, or Strand Beach on the Indian Ocean, side are also close at hand. 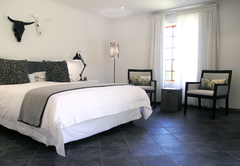 The guesthouse is in easy travelling distance to some of the most beautiful destinations South Africa has to offer. 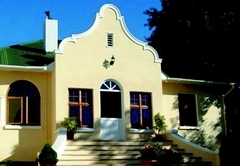 Explore the famous Wine Estates like "Lourensford" or historic "Vergelegen" (3 minutes) and all the others along the Winery Road. Visit our local Helderberg Nature Reserve. 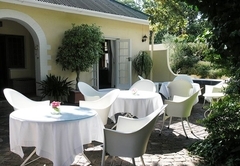 Visit historic Stellenbosch 15 minutes away where walking tours tell the history of the wine and brandy industry. 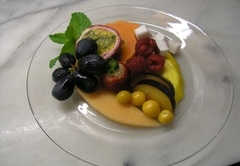 Enjoy the quaint art galleries and the famous local restaurants. 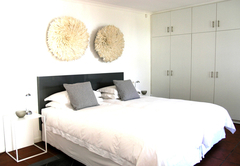 A short drive will take you to the Victoria & Alfred Waterfront in Cape Town. Visit the Two Oceans Aquarium or take a boat ride out to Robben Island, the legendary prison of Nelson Mandela. Take time out for an excursion to Cape Point, the Cape of Good Hope, or visit the penguins at Boulders Beach, close to Simons Town. You could go on a trip along the Garden Route, one of the most picturesque “road trips” of the world and while away in Hermanus - one of the best “whale watching” points on this planet! Somerset West lies in the heart of the Western Cape, only a 25 min drive from Cape Town International Airport (we can organize airport shuttle services) and is reputed to be one of the most beautiful residential areas of the Cape Peninsula. Child policyChildren 12 years or older are welcome.